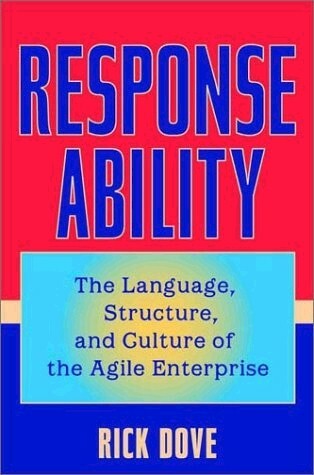 This book addresses the practical and physical aspects of how to become agile, and does not spend any real effort on the why question, or on the question of what to do with it once you have this response ability. Plenty of others are dealing with these unaddressed questions, while no-one as yet has addressed the how part. My observation is that people don't perceive a problem in any tangible, actionable form until they appreciate that a solution exists  and then they begin to define and understand the problem in terms of the solution. Here I will expose a solution. In 1991 I co-led an industry/government project at Lehigh University to identify the competitive frontier in 2005. This project gave birth to the concept of the agile enterprise. Our predictions were based on observations that the business environment was becoming less stable, that the driving forces toward more uncertainty were and would continue to accelerate, and that current organizations were not equipped to operate under these conditions. Our intention was to illuminate an inevitable future, and motivate business organizations to begin preparing for it immediately and seriously. Ours was an idea who's time had come. Which meant that others were thinking about the same inevitability, the consequences, and the strategies for both coping with increasing change and for turning this situation into advantage. Mass customization and organizational learning were two of the front runners then  one a prescription for marketing and manufacturing strategy, the other a prescription for cultural strategy. At about the same time tactical programs for change management and reengineering started sweeping through the business community, and lean manufacturing started removing the inertial fat. As the decade of the nineties progressed, each year saw more books with new ideas on how to cope with, and take advantage of, increasing uncertainty and accelerating market cycles. By and large these books focused on strategies for specific aspects of business, such as business strategy, marketing strategy, manufacturing strategy, information technology, and knowledge management. Two books written by colleagues from the original agility project took a broader enterprise view, creating a call to arms, illuminating a cross section of agile micro strategies under test in various industries, and suggesting new priorities. But still there was something missing. New and valuable ideas and strategies must be implemented. Implementation means changing some or all aspects of the organization; and the real underlying message was that these changes, however advantageous they might be when made, would have to be changed all too soon thereafter. How do you design an organization, and all of its parts, so that it is naturally agile  able to transform itself with competence into whatever the new situation requires? My research since that 1991 call to arms has focused on just that question. This research employed collaborative industry teams analyzing hundreds of highly adaptable business structures over an eight year period, looking for common underlying fundamentals. We found them. Being able to respond to proactive strategic direction, and being able to respond to reactive necessity, is what this book is about. This book illustrates what it is that makes a business and any of its systems easy to change, and then demonstrates how to apply these principles to any system in a company, at any level. It shows you how to analyze opportunities and problems for their operational dynamics, and ways to use these tools to establish a solution strategy. It also demonstrates how to measure change proficiency, and then how to use this tool to profile a company and establish improvement strategies. It then focuses on the role played by culture, and how to establish and insert these new values and competencies compatibly into an established corporate culture, no matter what it may be. This book answers the questions What to do?, How to do it? and Where to start?. It is first a book for doers who want to know how things work under the hood: for leaders, for strategists, for change agents, for operational managers, and for business planners who would be armed with knowledge, and the tools for imparting knowledge to others as a persuasive edge. In the hands of such people this book is also a supporting reference and tutorial for all others who will be part of the transformation. When that 1991 investigation proclaimed accelerated and constant change as the coming business environment, it was an intellectual concept that had not yet materialized. There was no emotional understanding in the business community as yet. Since then the scramble towards eCommerce in 1999 brought near panic to most established companies in most established industries, as well as to the new fire flies who's five minutes of flame is extinguished by a newer batch. eCommerce is not the driving force behind this uncertainty and upheaval, it is only the first major wave coming from a deeper reality: the explosion and rapid application of new knowledge coupled with increasing connectivity and communication. True business complexity has arrived, and there is no going back. eCommerce provides a good current backdrop. Everyone understands the need for an eCommerce strategy, but a company doesn't get an effective one without reengineering the organization considerably, and that's the hard part. An on-line order entry port is not what this is all about. eCommerce is so new its broader possibilities are not yet explored. If getting a first eCommerce strategy was a late wake-up call and cause for panic, getting another and another that is competitive will continue to be a panic for some time. New start-ups keep discovering new ways to redefine how eCommerce can change the rules. Welcome to the 21st century. To take the focus away from eCommerce, look at the satellite communications network business. Many of us watched Iridium's multi billion dollar 1999 bust, and turned our attention to Teledesic. But right in the middle of the Teledesic startup comes a pronouncement[i] that manned aircraft on overlapping rotating schedules can provide sky-beamed communications services at considerably less cost than satellites. Whether that turns out to be pie in the sky or not, six months after that announcement comes one about a combination helicopter-rocket[ii], which promises dramatic drops in satellite launch cost. New technology (knowledge) is threatening slightly-less-new technology with obsolescence even before it comes to market. I will not talk much about eCommerce or communications networks; but I will deal with how an organization can be made response able when eCommerce requires a different organization, a different distribution logistics, a different production capability, a different innovation capability, a different set of resources, a different product design, a different service strategy, or a different approach to anything. This book addresses the nuts and bolts and analytical side of organizational change proficiency. Its intent is to clear the haze surrounding the concepts of business agility and the agile enterprise by showing the fundamental principles which underlie an organization's ability to respond, and by showing how to apply these principles in real situations. It is the physics of the agile enterprise that is exposed here. As a byproduct, this fundamental viewpoint provides a strategic context for lean operating practices, puts knowledge management and the learning organization in perspective, and offers a framework for incorporating todays best advice on new business practices and strategic focus. This book breaks many rules of traditional authorship. First, it attempts to speak both to enterprise leadership and to operational management  two audiences with different interests and different perspectives. Next, it speaks across the organization to various functional managers, each with a different viewpoint and strategic focus. The risk is that it will satisfy none. The reward is that leaders understand the concepts and know that there is an implementation plan, that implementers respect the strategic context that justifies and guides implementation, and that managers understand that they all have something very much in common. The style of the book, also unconventional, attempts to make it fruitful for all. The material in this book is both broad and deep. In some respects it is written to the mythical business engineer and architect. That person who would know something of all aspects of the enterprise, and take responsibility for enabling both leadership and viability under highly dynamic conditions. There may be times when this book doesn't speak to your experience base, when it gets too low in the organization or too high, when it gets too strategic or too tactical, or when it gets too social or too technical. If you don't skip over the unfamiliar terrain you will find a common theme throughout, and find a common language and perspective that binds them all. But skipping is enabled. Reading this book may get your hands dirty. Many of the case examples are taken from the production floor, from product designs, and from information technology; and from the automotive, electronics, semiconductor, and aerospace industries. But there are also many examples dealing with other industries and service sectors, and dealing with organization design, supply chains, teaming, customer relationships, training tools, knowledge management strategies, knowledge worker relationships, and practically every other aspect of business. As a learner I need answers to my questions as I have them, which is generally not in the order that teachers or authors think I should receive them. In theory, hyperlinked documents allow you to delve into detail, gloss over unnecessary explanation, or explore a relevant side issue to fit your own knowledge base; speeding up your introduction to new material and allowing you to control your own level of personal excitement. You (probably) have in your hands a bound collection of paper which doesn't have a point-and-click interface as yet  so it is linear by nature. But like all such books, it does have a big advantage over today's on-screen text, hyperlinked or not  you can quickly flip through it and have some sense of what you are bypassing as you do. This book has been crafted with that style in mind, and the understanding that we all learn differently. I have always been intrigued with the way Scientific American illustrates their articles. For me, studying the pictures and their captions in many cases is sufficient. If you are a visual learner, as I am, you can get a pretty good overview from a cursory scan of the graphics in this book, and a reasonable amount of detail by reading the captions. Some readers may get a sufficiently complete story from only the pictures and tables and never investigate the back-up chapter text. Others will want to see the many different data points that create the final patterns. Reading erratically is expected and encouraged. In the chapter text we generally discuss the nature of a problem before exploring our approach to a solution, often with anecdotes and metaphors, sometimes directly. If you already understand the problems as I do, don't get bored as I belabor the obvious, skip ahead. But if you do skip, and the solution doesn't make sense, step back and review the perspective on the problem. Unavoidably some information may be difficult to fully comprehend if other information isn't understood first. Nevertheless, after an overview scan, much of the book should be comprehensible when taken in random bites. This book employs examples from many companies, but also leans heavily on four specific examples from four different companies. From these four specific examples you will see a pattern emerge that makes the material independent of any specific case. I will bombard you with examples from many different perspectives, some of which may be difficult to relate to if you haven't walked that mile in those shoes; but all are building a pattern, and there should be enough familiar examples here that the more obscure will bare their souls as the patterns emerge. The books of the nineties chronicled the need to thrive under conditions of high speed uncertainty. I will not do that here. I assume that you know that, and now want to know how. I would like you to know it at a visceral level when you have finished with this book, and that is what has guided the style of presentation. [i] Platt, C. (1999), "Ethernet at 60,000 Feet", Wired, June, pp 150-155, 208-209. "Already Proteus has made more than a dozen test flights in preparation for its ultimate mission: to cruise at 60,000 feet ...where it can do the kind of tasks routinely done by satellites...It could bring broadband wireless voice, interactive video, and data service to American consumers three or four years ahead of low Earth orbit satellite constellations such as Teledesic...A city can be served by a fleet of three Proteus airplanes, each carrying a 15-foot communications dish beneath its curved belly. One plane will circle for 8 hours, providing telecommunications for an area 50 to 75 miles in diameter. As it runs out of fuel, it hands off to the next plane, and so on, enabling uninterrupted 24-hour coverage." All of Teledesic's $9 billion system needs to be up and running before services can be provided, but Proteus can dominate a major market as soon as it puts three planes in the air  at a cost of $30 million; using revenues to finance additional major market coverage and leaving the sparse areas for Teledesic when it finally arrives. [ii] Port, O. (editor) (1999), "It's A Rocket! It's A Chopper? It's Both", Business Week, March 22, 1999, p 65. "It looks like a huge traffic cone that has sprouted a palm tree. But the 63-foot-tall Roton is a hybrid rocket-helicopter that Rotary Rocket Co. hopes will slash the cost of putting satellites into orbit  by as much as 90%...To make it happen he [founder Gary Hudson] has created a lightweight vehicle that will use whirling rockets to climb into orbit, then descend for a soft touchdown by unfolding helicopter blades. Roton's 72 rockets whirl like a fireworks wheel to create centrifugal force. That pushes fuel into the rockets and eliminates the need for the heavy and expensive turbo-pumps otherwise required."